In Western Christian tradition today goes by a number of names including Holy Wednesday and Good Wednesday. It can also be called Spy Wednesday because of certain events mentioned in the gospels. Unfortunately the Synoptic Gospels and John’s Gospel diverge considerably on the order and timing of the major events of Holy Week although they generally agree concerning the events themselves with some minor variations as to particulars. The chronology in John is very different. There the event happens before the triumphal entry on Palm Sunday, but in some Western liturgical traditions Mark’s chronology is accepted and gives us the name Spy Wednesday where “spy” means essentially “ambush” or “betrayal.” Two events are linked in Mark’s narrative – the anointing of Jesus and Judas’ decision to betray him – but in John the relationship is much clearer, and some added details have caused a lot of speculation. 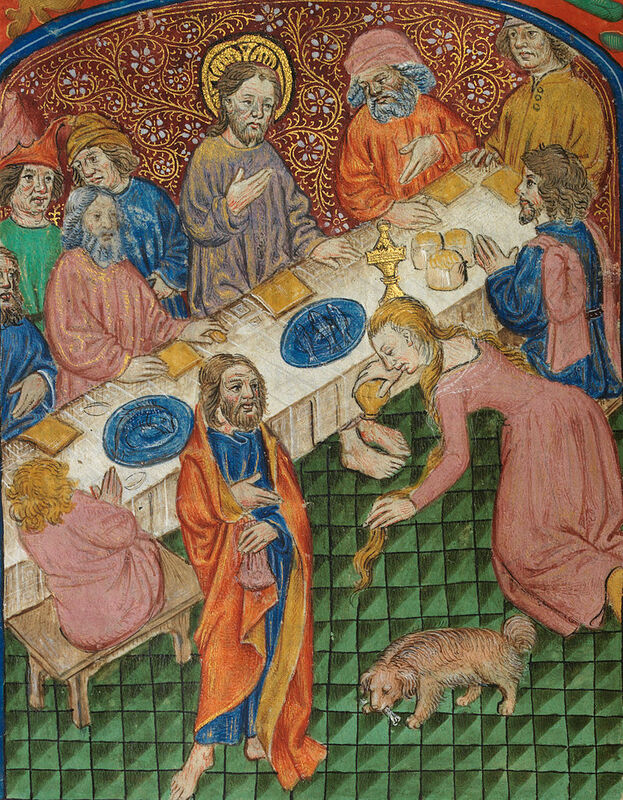 In John it is Judas who complains about the waste of the perfume but he is accused of hypocrisy in that he didn’t want to help the poor but himself. Seeing the lost opportunity enrich himself he goes to the Sanhedrin seeking a bribe for betraying Jesus’ whereabouts. The general point is that Jesus preached openly in the daytime and generally infuriated the authorities with his message which was harshly critical of the status quo from which they all benefited. They wanted to get rid of him but were afraid to arrest him in broad daylight surrounded by a sympathetic mob. In the evenings, however, he seemingly vanished into thin air and no one, with the exception of his closest friends, knew where he went. To seize him in the evening one of his friends would have to turn on him. Judas obliged. The woman who poured expensive perfume on Jesus is not given a name in Mark but is called Mary in John. Luke places this whole event at a different time in Jesus life, and characterizes the woman as a sinner. Putting these diverse details together leads a few commentators to declare not only that the woman, named Mary, was a sinner, but that she was none other than Mary Magdalene. This identification is extremely problematic. Mary Magdalene comes to the fore during and after the crucifixion, it is true. She is highly prominent, especially because she is said to be the first witness to the resurrection, and the first evangelist. She is mentioned in the gospels more than most of the apostles by name. Medieval scholars conflated her with the Mary who anointed Jesus, and taking the theme from Luke, suggests she was a reformed prostitute. These are completely unwarranted conclusions. There is not a shred of evidence from the gospels that Mary Magdalene was a reformed prostitute, nor that she was the Mary who anointed Jesus. Mary (Miriam) was a very common name. 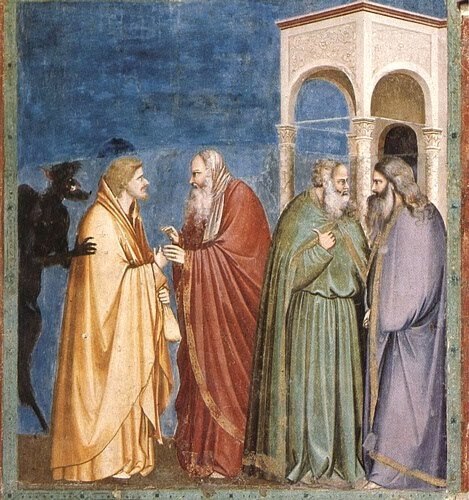 Scholars are also deeply divided as to why Judas betrayed Jesus. The darker side of all of this, that is rarely raised, is that the Romans executed him, not the Sanhedrin, but the gospels all go out of their way to blame the Sanhedrin for starting the whole process. Hence in history one of the crimes laid at the door of Jews by Christians, fueling anti-Semitism, is that they (not the Romans) killed Jesus, and so must pay for their sins. That narrative works for the gospel writers because they, thus, avoid appearing anti-Roman at a time when being publicly anti-Roman got you killed. So, Judas betrays Jesus to the Sanhedrin, not to the Roman authorities. 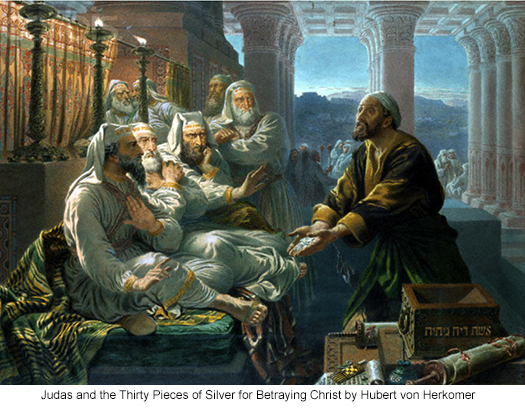 Judas was greedy and was looking for a bribe, so he sold out Jesus for 30 pieces of silver. What really happened? Nothing really adds up here. Why would a trusted member of Jesus’ inner circle betray him at all. We could start with the idea that there were 12 apostles. Were there really? There were 12 tribes of Israel so there is some clear symbolism being promoted here. But “the twelve” are a bit of a shadowy lot. The gospels do not agree concerning the names of all of them for starters, and clearly some are more central than others. What do you remember about Thaddeus, for example, or Bartholomew? 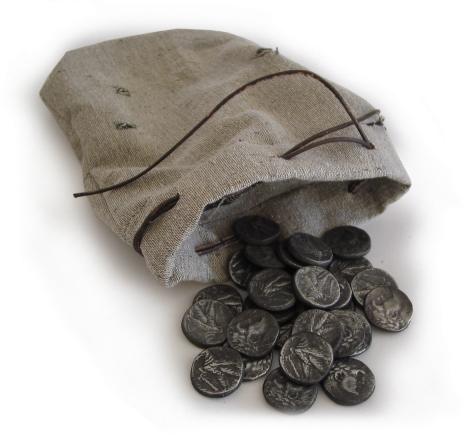 Judas Iscariot is identified as the treasurer of the group (or keeper of the purse). Otherwise there’s nothing to single him out prior to his betrayal. One idea that springs off the top of my head is that there was a genuine inner circle – Peter, James, and John – and a lot of hangers on who came and went, some closer than others. Judas was one of these fringe elements who was intrigued by Jesus’ message but without a lot of conviction in it. There must have been a lot of this type – especially men. What is clear from the gospels, as well as Paul’s letters, is that the backbone of Jesus’ following were women, not men. This makes the scene of Jesus’ anointing at dinner all the more poignant. The guys just, more or less, sit around and do nothing while a woman makes a profound sacrifice of love and devotion (and one of the supposedly faithful men sneaks off and sells him down the river). This mirrors the general state of affairs in Judah (and the Roman empire) of the day, and is still the dominant posture of many Christian denominations. They lived in, and we live in, unabashedly patriarchal societies. Was one of the major problems that Jesus had with the powers that be – Jewish and Roman – that he had a very large female following in a culture dominated by men? Hard to say, but I suspect so. 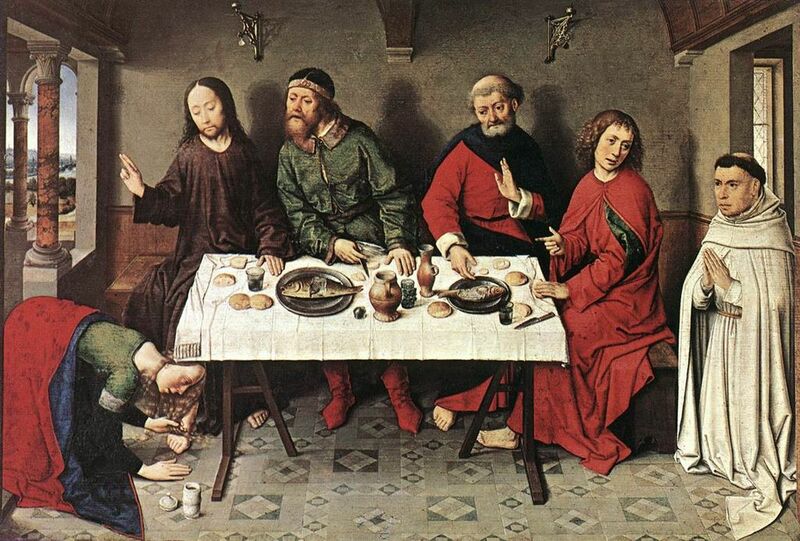 Today’s putative events took place, as did so many of Jesus’ telling moments, at the meal table. I’ve talked quite a bit about the typical cuisine of ancient Judah, so you can pick from the many standard ingredients: lentils, olives, grapes, fish (of course), as well as eggs, flatbread and the like. Meat would not have been common, and, naturally, I’ll save lamb for Sunday. The ingredient that springs to mind for today is figs because of another minor (and inscrutable) event of Holy Week. On the way to the Temple one day Jesus is hungry but when he inspects a fig tree for fruit is has none (because it is not the right season). So he curses it, and on returning it has withered. What did the tree do wrong? Would you curse an apple tree in March because it bore no apples? About the best commentators can come up with is that Jesus was symbolically cursing people who are all talk (showy foliage) and no action (fruit). Maybe so, but figs are great – dried or fresh. When they are in season I slice fresh figs and eat them on bread with sharp cheese. The combination is unbeatable. 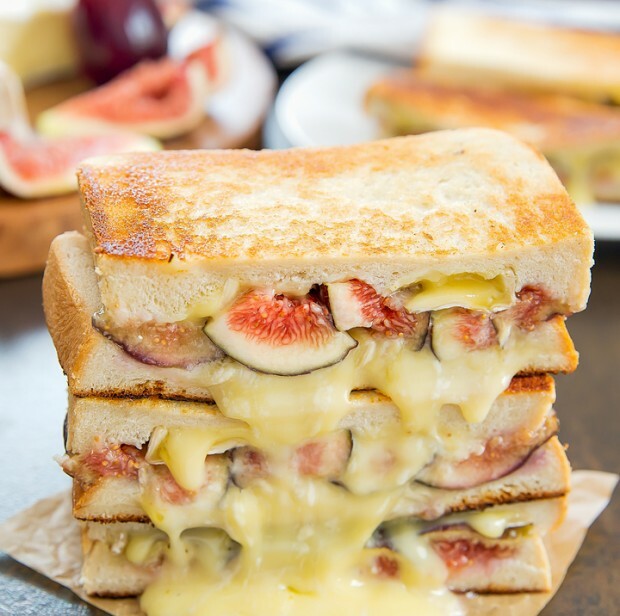 For a truly great sandwich place figs and cheese between slices of whole grain bread and grill the sandwich on both sides until the bread is nicely toasted and the cheese melted and gooey. 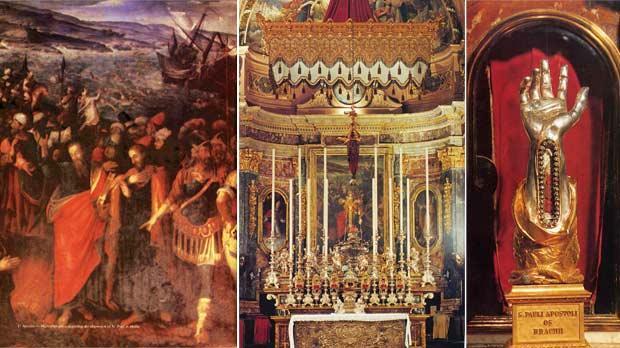 Today is the feast day of St Paul’s Shipwreck (San Pawl Nawfragu) which is a public holiday in Malta, especially in Valletta, Marsalforn, and Munxar. I am not sure why this date was chosen. The event is described in the Acts of the Apostles (Acts 27:27-28:5), the tail end of the book. The chronology of events in Paul’s life is endlessly disputed by scholars because what facts can be gleaned from letters that we are reasonably certain were written by Paul are not always in agreement with Acts. According to Acts Paul arrived in Jerusalem on his fifth and final visit in 57 with a collection of money for the community there. Acts reports that he was warmly received, but goes on to recount how Paul was warned by James and the elders that he was gaining a reputation for being against the Law, saying “they have been told about you that you teach all the Jews living among the gentiles to forsake Moses, and that you tell them not to circumcise their children or observe the customs.” (Acts 21:21) Paul underwent a purification ritual in order to give the Jews no grounds to bring accusations against him for not following the law. But he then caused a stir when he appeared at the Temple, and he escaped being killed by the crowd only by voluntarily being taken into Roman custody. When a plot to kill Paul on his way to an appearance before the Jews was discovered, he was transported by night to Caesarea Maritima. He was held as a prisoner there for two years, until a new governor reopened his case in 59. 27:27 On the fourteenth night we were still being driven across the Adriatic Sea, when about midnight the sailors sensed they were approaching land. 28 They took soundings and found that the water was a hundred and twenty feet deep. A short time later they took soundings again and found it was ninety feet deep. 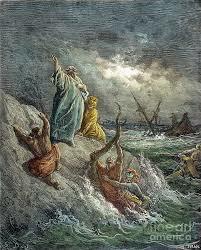 29 Fearing that we would be dashed against the rocks, they dropped four anchors from the stern and prayed for daylight. 30 In an attempt to escape from the ship, the sailors let the lifeboat down into the sea, pretending they were going to lower some anchors from the bow. 31 Then Paul said to the centurion and the soldiers, “Unless these men stay with the ship, you cannot be saved.” 32 So the soldiers cut the ropes that held the lifeboat and let it drift away. 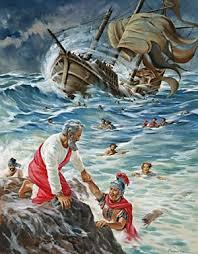 28:1 Once safely on shore, we found out that the island was called Malta. 2 The islanders showed us unusual kindness. They built a fire and welcomed us all because it was raining and cold. 3 Paul gathered a pile of brushwood and, as he put it on the fire, a viper, driven out by the heat, fastened itself on his hand. 4 When the islanders saw the snake hanging from his hand, they said to each other, “This man must be a murderer; for though he escaped from the sea, the goddess Justice has not allowed him to live.” 5 But Paul shook the snake off into the fire and suffered no ill effects. 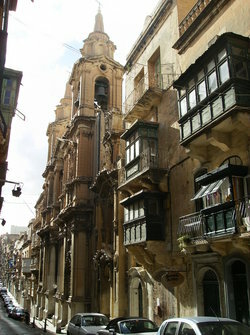 There is a special celebration in Valletta on Malta at the Collegiate Parish Church of St Paul’s Shipwreck on this day. The church hosts fine artistic works, including the magnificent altarpiece by Matteo Perez d’Aleccio, as well as paintings by Attilio Palombi, and Giuseppe Calì. The wooden titular statue of St Paul was carved in 1659 by Melchiorre Cafà, the brother of Lorenzo Gafà who designed the dome. The statue is paraded through the streets of Valletta on the feast day of St Paul’s Shipwreck even (and appropriately) during heavy rain One can also view the relic of the right wrist-bone of St Paul, and part of the column from San Paolo alle Tre Fontane, on which the saint was reputedly beheaded in Rome. 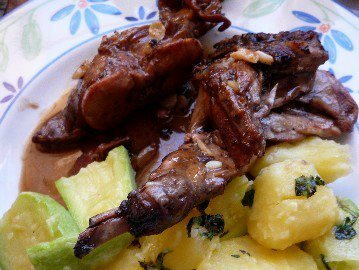 For this feast day I have chosen the unofficial national dish of Malta, rabbit braised in red wine and garlic. Given the name, you scarcely need a recipe, but here goes. The trick is to use A LOT of garlic. This recipe calls for three BULBS, not cloves – whole bulbs. Place the rabbit pieces in an earthenware pot and cover with the wine. Refrigerate overnight. In a large, heavy skillet gently sweat the garlic in the olive oil. Do not let it take on color. Remove and reserve the garlic, leaving the oil in the pan. Heat the oil on medium-high, remove the rabbit pieces from the wine, and brown them in the oil on all sides – reserving the wine. Place the rabbit, garlic and bay leaves in an ovenproof casserole. Cover with the wine, and season to taste with salt and pepper. Cover and bake at around 375°F for an hour or until the meat is tender. Check the liquid level periodically to make sure that the wine is reducing to a thick sauce, but not drying out. Uncover towards the end if it is not reducing sufficiently. Serve with boiled new potatoes and marrowfat peas.